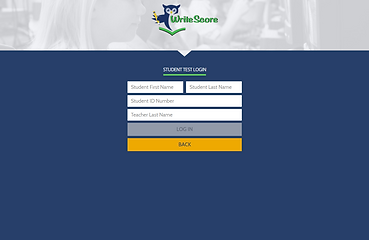 Write Score fully aligns to the Georgia Standards of Excellence for English Language Arts K-12 for Writing and provides materials to help measure and instruct on those standards. After essays are submitted for scoring, data results are returned quickly via an online teacher data report which breaks the scoring down into the two reporting categories: Idea Development, Organization, and Coherence; and Language and Conventions. Within those reporting categories, specific response detail information helps provide targeted data to use in monitoring specific aspects of students’ writing and in making instructional decisions. For example, teachers will receive information on students’ proficiency with writing introductions and conclusions, incorporating attributions, writing with focus, and much more. Keeping in mind the demands on teachers’ planning time, Write Score includes a bank of instructional materials aligned to each data point in our scoring criteria. Approximately 60 lesson sets per grade level are available at the beginning of the year in each grade level for topics ranging from introductions to attributions, and transitions to development of support. Most lesson plan sets include a lesson plan that is written in the Gradual Release of Responsibility Model, a PowerPoint that is grade and age-level appropriate with relatable content, a student handout, and a teachers’ edition. Many lessons also contain an additional resource such as additional texts, a graphic organizer, or other handout. After students’ results are released, post-assessment resources become available, including access to the actual student assessment and an annotated, high-scoring exemplar essay. Shortly after results become available, teachers will receive a customized email with links to resources that target the areas of greatest need. Grades K-2 available assessment genres include Opinion, Informational, and Narrative Writing. Students will be focused on developing comprehension strategies that will enable them to manipulate grade-level texts of appropriate complexity, and communicate effectively in writing. Students will begin to anchor their responses firmly to the text, whether literary or informational, using specific and relevant evidence to support their claims and inferences. Opinion/Argumentative Writing – a reasoned, logical way of demonstrating that the writer’s position, belief, or conclusion is valid. Students will make and defend claims regarding informational topics, analyze sources, and draw on text-based evidence. Informational/Explanatory Writing – students will draw on text-based evidence to develop controlling ideas focused on a specific topic and work to incorporate relevant facts, information, and details effectively. Informational writing serves one or more closely related purposes: to increase readers’ knowledge of a subject, to help readers better understand a procedure or process, to provide readers with enhanced comprehension of a concept. Three Selected Response Questions and One Constructed Response Question that scaffold students’ understanding of the articles and help prepare them for the culminating essay response task. Assessments are provided for students’ use in our online student testing portal or in paper/pencil format. Each student’s essay is hand-scored analytically using data points that align directly with state assessment rubrics. Our professional scorers go beyond just reporting analytical scores in each of the two reporting categories: Idea Development, Organization, & Coherence and Language Usage & Conventions. Within those reporting categories, specific response details help identify weaknesses within a student’s writing and in making instructional decisions. Administrators and teachers alike will find that Write Score’s Online Educator Portal is a valuable tool for enriching classroom instruction, personalizing learning, and tracking students’ growth. Our Educator Portal provides teachers and administrators with quick and easy access to all the Write Score testing tools, data, and resources for our reading and writing programs. step-by-step instructions, rosters, video tutorials, and testing schedules. student test monitoring in real time to quickly note overall class and grade-level testing completion percentages and progress. multiple detailed and accessible data reports facilitate the analysis of student performance, helping instructors identify specific weaknesses, strengths, and trends. each grade level of our reading and writing programs also includes a large bank of engaging lesson plans and resources that correlate to data reports, helping simplify targeted instruction. how-to resources are also included and accessible to educators. Instructors’ targeted instruction to improve writing is further simplified with our one-click bank of instructional materials, directly from the Educator Portal. Lesson plan sets are written to state standards in the gradual release of responsibility model. Our engaging and structured bank of lessons help keep students’ interest for optimal learning! Targeted Lesson Plans – lesson plan sets are aligned to each data point in our scoring criteria and are available for topics ranging from introductions to attributions, and transitions to development of support. Lesson plan sets include: a lesson plan, a PowerPoint, a student handout and a teachers’ edition. Exemplar Essay Lesson Grades 3-12 – a powerful lesson that includes an annotated, high-scoring exemplar essay. This lesson will breakdown and analyze the specific writing characteristics on which students are assessed and provides guided questions for student instructional activities. Each assessment’s data is accompanied with an exemplar lesson.